Schuhmacher Trachten necklace with brown cord band. This striking Schuhmacher necklace is a brilliant companion for decorous Trachten-lovers. 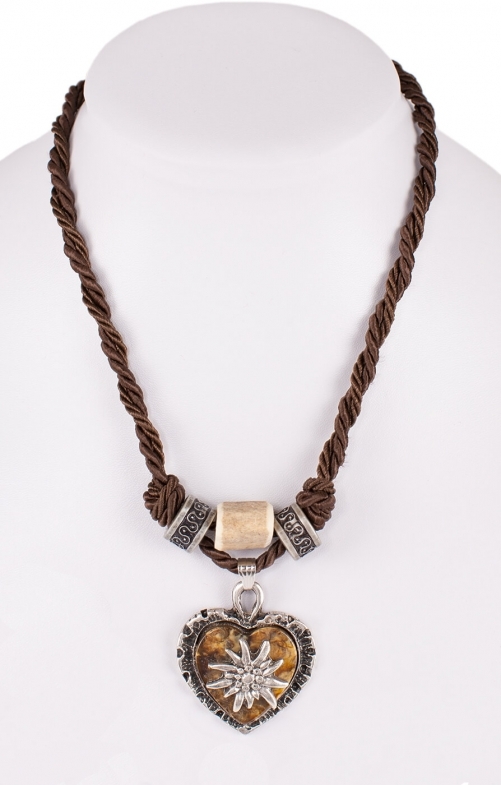 Fierce, and yet delicate, this necklace is fitted with a wonderful metal heart pendant in an old-silver look. A stone is set at the centre of the heart and surrounded with a decorative edelweiss motif. Three further pendants are adorned with a delicate pattern and are joined by an additional horn shaped charm. A small lobster clasp lets you close the necklace and adjust it to your favoured length. This pretty piece of jewellery makes an extraordinary accessory and is perfect for young women. It can be worn with a dirndl, or simply with a plain white blouse. Preis/Leistung in Ordnung. Schöne Halskette.